Nigerian photographer Okhai Ojeikere has been capturing some of the most outstanding African hairstyles since the late 1960s. His Hair Style project is perhaps his best known. This cone-shaped style, entitled Modern Suku, is from 1975. 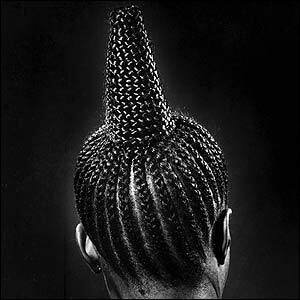 Etine Uton Eku, from 1971, is one of almost 1,000 haircuts that Ojeikere documented since beginning the Hair Styles series in 1968. 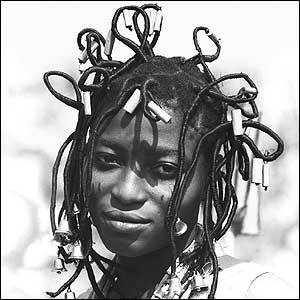 The intention was partially to show how hairstyles reflect Nigeria's varied ethnic make-up - over 200 peoples, all with different traditions, live in the country. 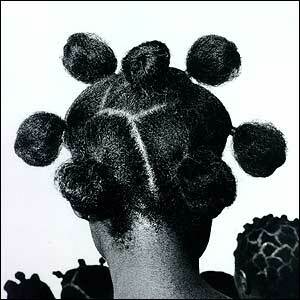 This 1974 pom-pom style haircut, entitled Mpuk Epa, is one of Ojeikere's most iconic images. It is one of two currently on sale through an internet art dealing site. 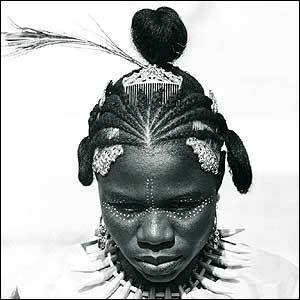 Ojeikere believes that hairstyles are one of the ways his country's culture has expressed itself. I'm awestruck! Is there a book?